The Canon EF 24-70mm f/2.8L II USM Lens is clearly the best performing Canon full-frame-compatible general purpose zoom lens available. It is the best from both an image quality perspective and from an AF speed/accuracy perspective. This lens is very sharp/has excellent contrast across the frame even at f/2.8 and is well built, focuses extremely fast and contains a most-used range of focal lengths. The cons? Price and lack of image stabilization. 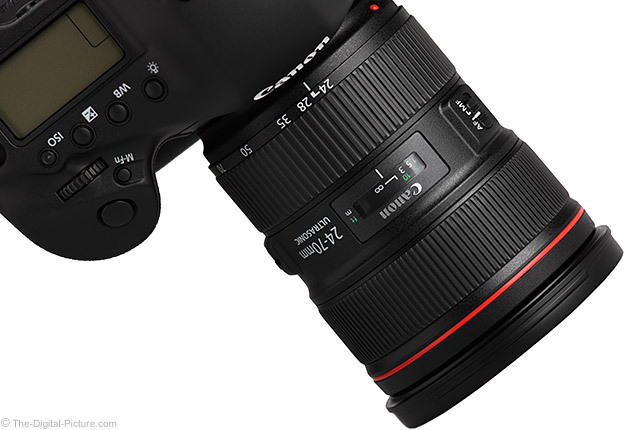 The second best Canon full-frame-compatible general purpose lens is now the Canon EF 24-105mm f/4L IS USM Lens. Before the 24-70 L II arrived, I spent a lot of time helping people decide between the then-best choices, the 24-70mm f/2.8L Lens and the Canon 24-105mm L IS Lens. These pro-grade lenses are both impressive, but most people I was working with wanted both the f/2.8 max aperture AND image stabilization. Choosing between these two important features was a dilemma. And much to my disappointment, the dilemma is still not resolved - the 24-70 L II does not have image stabilization. For some, the 24-105 L IS remains the best full frame general purpose lens choice. 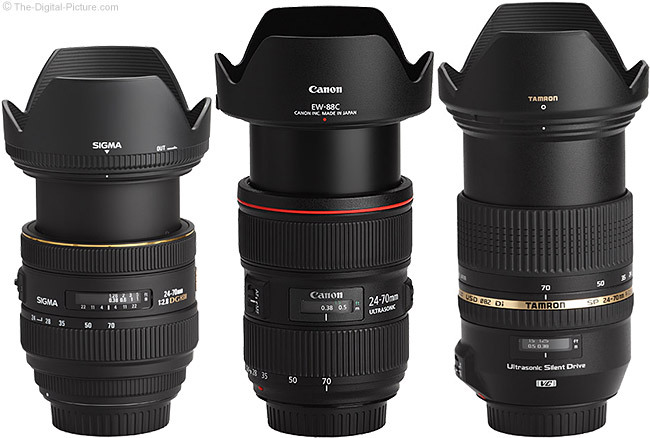 As of the Canon EF 24-70mm f/2.8L II USM Lens review date: Excluding the Canon EF 8-15mm f/4L USM Fisheye Lens, Canon has not released a non-IS zoom lens since the Canon EF 16-35mm f/2.8L II USM Lens five years prior (2007). Aside from two cheap EF-S 18-55mm kit lenses, the only other non-IS Canon Zoom Lens released after 2003 was the Canon EF-S 10-22mm f/3.5-4.5 USM Lens. 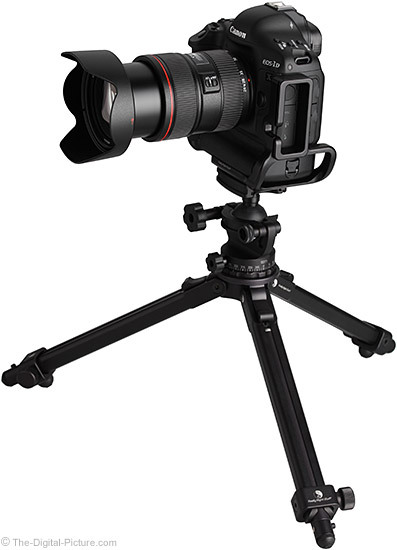 Canon omitted image stabilization to achieve the absolute ultimate image quality possible with the least-complex design. Obviously, I'm disappointed with Canon's decision to omit IS, but I am definitely not disappointed by the image quality this lens delivers - or by its AF speed. 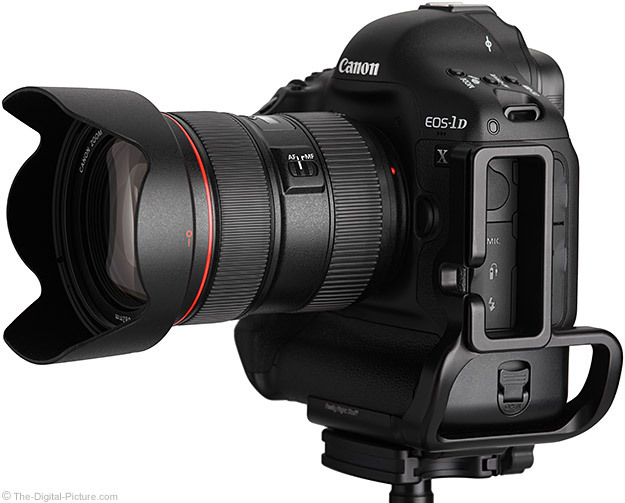 Shooting with a full frame Canon EOS DSLR? The 24-70 L II's focal length range falls squarely in the recommended general purpose lens focal length range. Shooting with an APS-H (1.3x) or APS-C (1.6x) DSLR? The 24-70mm range is still a great choice, with the realized angle of view shifted longer within the most commonly needed range. 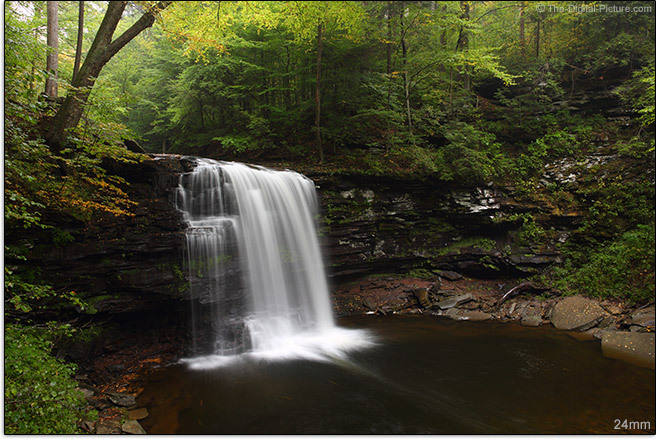 For a focal length range example from a 5D Mark III sensor's perspective, I take you to the Harrison Wrights Falls in Ricketts Glen State Park (Endless Mountain Region, Benton, PA). The extremely useful 24-70mm focal length range is complemented by a constant-over-the-entire-focal-length-range, wide-as-it-gets-in-a-Canon-zoom-lens, f/2.8 max aperture. Combined, the real world uses for the Canon EF 24-70mm f/2.8L II USM Lens are endless. 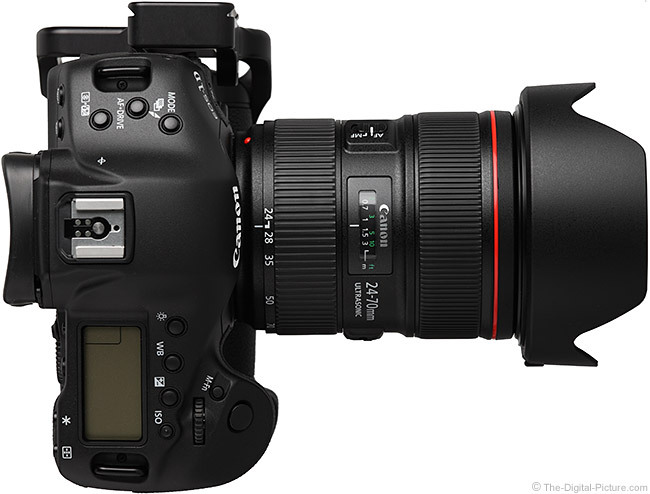 The 24-70 L II will be the bread and butter wedding lens for a significant percentage of professional photographers. The 24-70mm focal length range allows a large group shot or a close-up picture of the bride without a lens change. And these shots will be accomplished in the typically dark-as-a-cave venues weddings typically occur in. The fixed f/2.8 max aperture allows wide open camera settings to remain constant with focal length change - allowing the photographer to focus on getting the job done. As portraits are a staple of wedding photography, the 24-70 L II makes a great portrait lens. On a full frame body, group, environmental and moderately tight portraits work best. Full frame 70mm is too wide for a tight head shot - for my taste at least. Save those shots for the longer focal lengths in the Canon EF 70-200mm L IS II USM Lens. On a APS-C/1.6x body, more working space is needed for group photos at 24mm, but tighter 70mm portraits are more pleasing due to the longer distance they will be framed from. Since shooting a wedding is not too dissimilar from photojournalism in many regards (and many wedding photographers employ photojournalistic techniques), the 24-70 L II is also a great photojournalism lens choice. Indoor and low light sports photographers are often working in similar conditions as wedding photographers and photojournalists. But their subjects are often moving faster. An f/2.8 aperture is generally the narrowest I recommend for indoor sports. Thus the 24-70 L II is a great choice for short range sports action and it works especially well in combination with the 70-200 f/2.8 IS II mounted to a second body. Regardless of your profession, the 24-70 L II will work just as well in your home as it does in the church, gym or other indoor venue. Capturing the memories of family life is, in my opinion, one of the most important photography pursuits. You can sell the lens later if finances become tight, but those precious family moments will never be back for capture later. The 24-70 L is also a very good landscape lens (though it would be an even better choice if it had IS), especially on a full frame body. It will work fine on a crop body, but the full frame 38.4mm angle of view equivalent is a little long for the wide end of a dedicated landscape lens. Add a Canon EF-S 10-22mm USM Lens to your 24-70 L II kit if landscapes are your goal. 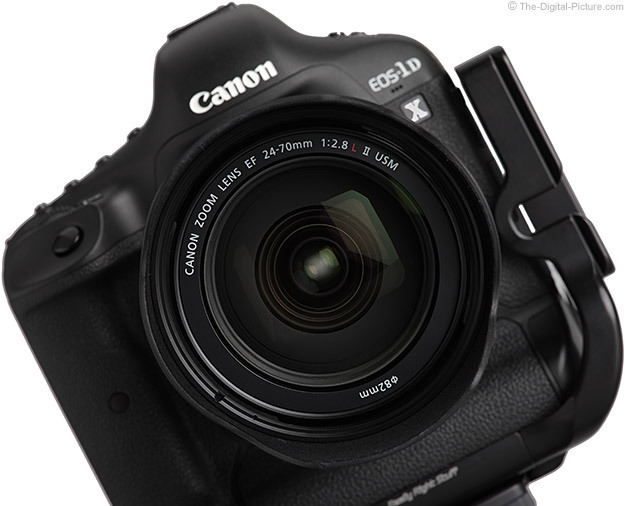 Or get the EF-S 17-55 or EF-S 15-85 instead. 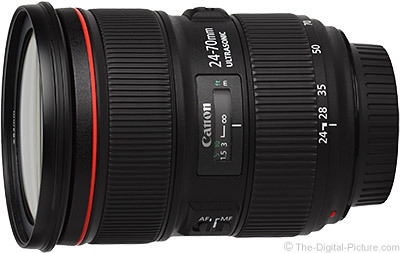 The Canon EF 24-70mm f/2.8L II USM Lens was announced on February 7, 2012. For the next 7 months, all we had to look at other than the press release, product images and delay notices were the MTF charts. And the estimated retail price - but the MTF charts felt much better to look at. The price and MTF charts both indicated that we should expect great things from this lens. Roger Cicala of LensRentals.com confirmed that contrast and resolution expectations were met upon receiving his first batch of Canon EF 24-70mm f/2.8L II USM Lenses, which of course increased my anticipation - and expectations. With my first two retail-purchased lenses in hand, what I was seeing reflected this expectation, but involved a complication. I often preorder more than one copy of Canon's new lenses as I like having at least two sets of image quality results to work from. I seldom see much variation between the multiple copies, especially between Canon's higher grade L lenses. Unfortunately, two copies of the Canon EF 24-70mm f/2.8L II USM Lens were not enough. My first copy (now "Sample 2" in the ISO 12233 chart results) was extremely sharp wide open (f/2.8) across the entire focal length range - until 70mm at f/2.8 where its performance is only average and even trails the original Canon EF 24-70mm f/2.8L USM Lens in the center of the frame. An ISO 12233 chart retest of this lens delivered identical results. Real world shooting confirms the test results. This lens is so sharp at the rest of the focal lengths and at 70mm f/4 that I was hesitant to return it. A significant backfocus problem at 70mm (note that manual focus is used for image quality evaluation) made the keep or return decision a no-brainer as I need to be able to use this lens on non AFMA-capable DSLRs. Copy 2 (now "Sample 3" in the ISO 12233 chart results) of the 24-70 L II was very sharp in the center of the frame at f/2.8 throughout the entire focal length range - including at 70mm. The problem with this lens is that the mid and outer portion of the image circle is not as sharp at f/2.8 as copy 1. This is perhaps a misalignment problem. With what I believe is a properly tuned lens in hand, I can continue this review. The ISO 12233 chart results I think most accurately reflect the image quality you should expect from this lens are shown as the default ("Sample 1") lens in this tool. The Canon EF 24-70mm f/2.8L II USM Lens is an incredibly sharp lens with excellent contrast across the entire focal length range and the vast majority of the image circle. The main image quality reasons to stop down the aperture beyond wide open f/2.8 is to gain DOF (Depth of Field), reduce vignetting and/or to simply gain a longer exposure duration. Full frame corners are especially impressively sharp at 24mm f/2.8. A trend I'm seeing with the many copies of this lens I've tested is that corners may be slightly less sharp in the middle of the focal length range (35-50), and if I had to pick a weakest focal length for overall image sharpness, it would be 70mm. Still, this lens delivers very impressive image quality. The "II" is considerably sharper than the "I" at f/2.8 and still noticeably sharper at f/4. The "II" retains better contrast at even narrower apertures, but the differences are not as exaggerated. As you will notice in the autofocus speed sample picture (horse jumping) below, there is a noticeable amount of vignetting in 24mm f/2.8 full frame corners - about 3.5 stops. 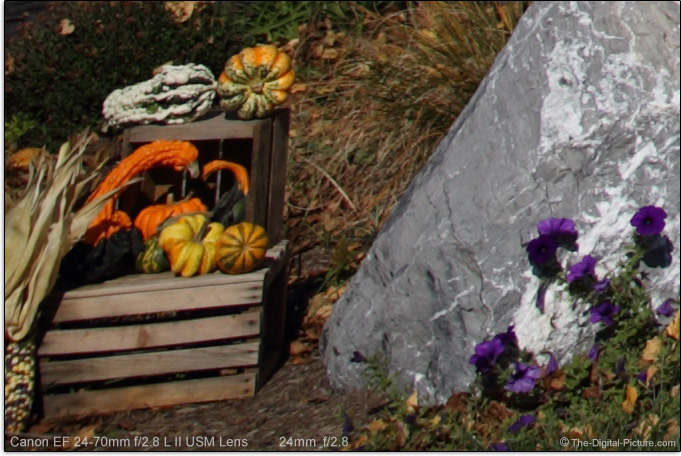 About 2 to 2.5 stops of peripheral shading is present throughout the rest of the focal length range at f/2.8. This corner shading is similar to what the 24-70 L I shows, but the "II" provides a modestly larger sweet spot over most of the range. Stopping down to f/4 removes a stop or more of shading from the corners. Shading remains just-noticeable in the corners at very narrow apertures at the wide end of the focal length range. Full frame body owners will probably want to use a slim CP filter with this lens - to avoid the additional vignetting the thicker filters deliver at 24mm. B+W's flagship XS-Pro CP filters are my current choice. APS-C/1.6x sensor format DSLR owners will not likely notice vignetting when using this lens - even at 24mm f/2.8. The 24-70 L II will show some flaring with a bright light source in the frame - especially with a stopped-down aperture. Most will appreciate the II's 35mm flare pattern much better than the I's: example. While different, the II has slightly more flare in many direct comparisons - perhaps because of the larger front lens element? Typical for a zoom lens is the 24-70 L II's barrel distortion at the wide end that transitions to pincushion distortion from the low 30s onward. Distortion amounts at the focal length extremities are moderate - enough to be noticeable if straight lines are present near the edges of the frame. The 24-70 L II has very slightly more distortion than the 24-70 L I - but the difference is not likely relevant to most. APS-C format results will have negligible amounts of distortion save 24mm where a small amount of barrel distortion might be visible in some photos. 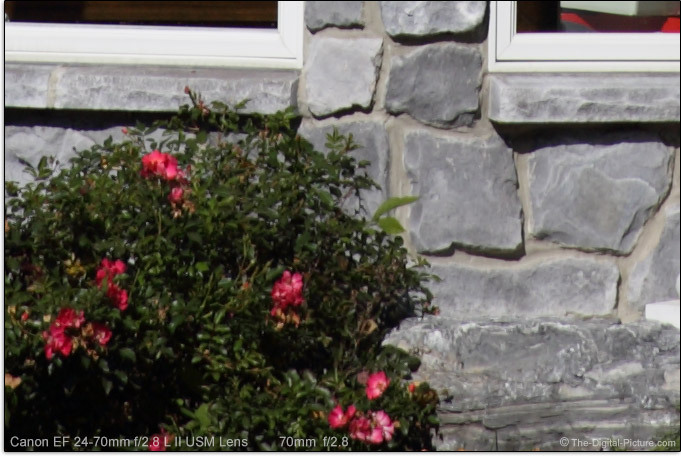 While distortion can be corrected during post processing, this process is destructive - moving pixels around - and results in reduced overall image quality. Another issue presented by distortion is seen in the viewfinder. I have enough trouble keeping a camera level when shooting, but having a curved horizon in the viewfinder makes leveling the camera especially challenging. The electronic level feature available in the newer/better DSLR models has been especially beneficial to me in this regard. CA (Chromatic Aberration) is barely noticeable at 24mm and quickly becomes negligible until about 50mm where CA starts creeping back into the corners. CA worsens through 70mm where the amount is still not bad for a zoom lens focal length extremity. The 24-70 L II has slightly less CA than the 24 L I at 24mm, but the I has less CA at 70mm (by a larger differential). CA is generally easy to correct in post processing. The 24-70 L II turns in reasonable background blur quality (often referred to as bokeh). Following is a bokeh comparison (click on the image - opens in new window) between five 24-something lenses with a few additional L prime lenses thrown in the mix. 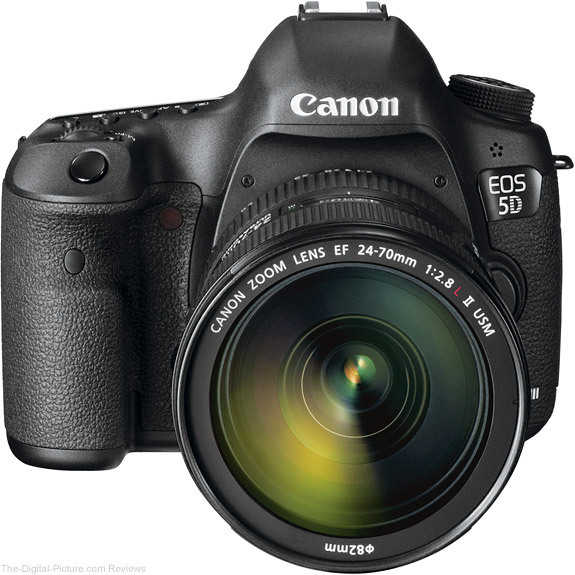 All lenses and focal lengths were tested using a stationary (tripod-mounted) Canon EOS 5D Mark III. The same focus target was used for all test shots and manual focus was used to obtain ideal focus for each focal length tested. Focal length marks on the lenses were used for establishing the focal length setting for each shot. The relatively wide angle focal lengths found in these lenses need a close subject and relatively distant background to create a strong background blur. Perhaps the biggest difference you are going to see below is that the 24-70 L I acts as a longer focal length lens than most of the other lenses compared here at this relatively close focus distance. Again, click on the image below to see the full comparison. Overall, differences (other than the enlargement of the blurred subjects/specular highlights in the 24-70 L I and 50 L examples) are not very easy to see - and the differences will not be very significant in your image results. One exception is the comparatively harsh background blur quality created by the Tamron 24-70 VC. Unique also is that the Tamron framed the test scene a bit higher than all of the other lenses. With 9 rounded aperture blades (up from 8 in the I), the 24-70 L II will create 18-point stars (up from 8-point stars) from specular highlights when very narrow apertures are used. The color and contrast this lens delivers is impressive for any lens, let alone a zoom lens. Remember the image quality differences between the Canon EF 70-200mm f/2.8L IS USM Lens and its replacement, the Canon EF 70-200mm f/2.8L IS II USM Lens? While the image quality difference between the 24-70 L and 24-70 L II may not be quite as large overall, the differences at f/2.8 definitely remind me of that upgrade. 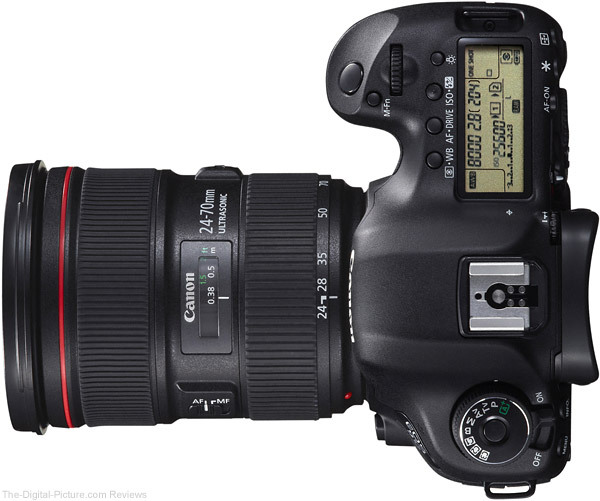 Following is the Canon EF 24-70mm f/2.8L II USM Lens mounted on a Canon EOS Rebel T4i. As you would expect and like its predecessor, the Canon EF 24-70mm f/2.8L II USM Lens utilizes Canon's best-available Ring USM (Ultrasonic Motor)-driven AF system. 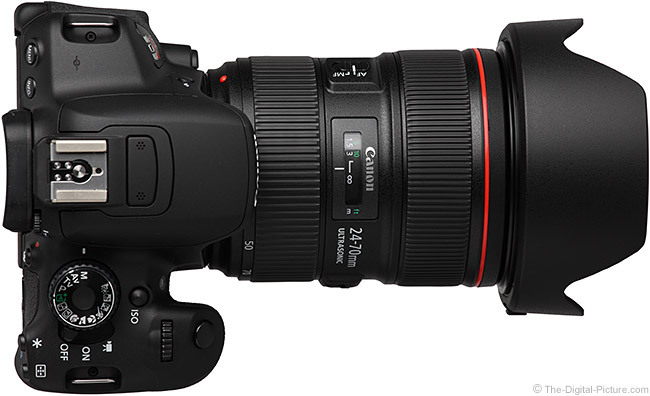 With only the sound of some lens element movement inside, the 24-70 L II focuses extremely quickly. What I did not expect was II's the very noticeable AF speed improvement over the 24-70 L I. Using 5D III and 1D X bodies, I went back and forth between the two lenses, focusing on the same close and then distant points. It didn't matter which body it was mounted to, the 24-70 L II was the fast focusing winner between the two. I'm impressed. After posting part 1 of the 24-70 L II review, I was asked if the autofocus speed difference between the I and II was noticeable on lower end DSLRs. 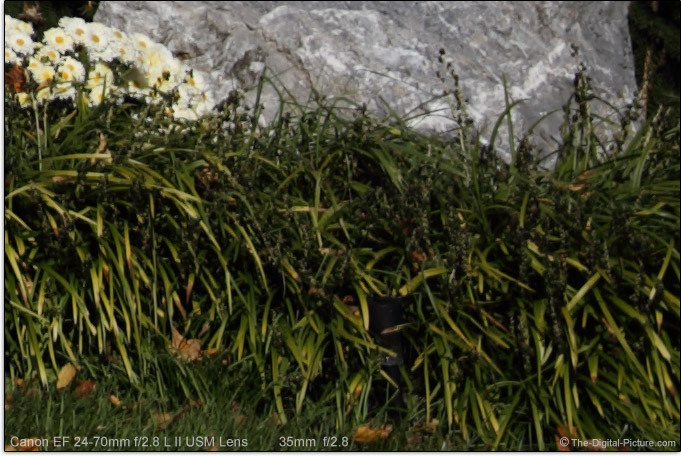 Since I had already sold the I, Roger Cicala (LensRentals.com) did an autofocus comparison test for me using a T4i. Roger's response was "No difference". It is likely that the older 9-point AF systems will not appreciate the focusing speed improvements in this lens. Of course, the fastest focusing lens in the world is worthless if it sacrifices accuracy for speed. Not surprisingly is that the 24-70 L II focuses very accurately in the not-too-challenging One Shot AF mode. AI Servo is most typically where the challenge begins. A zoom lens with an f/2.8 max aperture across the entire focal length range begs to be used for capturing sports action including indoor sports action. Excellent AI Servo autofocus performance is critical for capturing sharp fast-moving subjects. Responsibility for AF performance resides in part with camera and in part with the lens - and this lens gets its part right. The 24-70 L II's in-focus hit rate for fast-closing subjects at even close range is impressively high (when I do my part right of course). Cantering/jumping horses were the most challenging subject I threw at the 24-70 L II as of review time. Update: This lens has also worked very well for track and field events. Other than selecting the Standard Picture Style (shooting Neutral in-camera), setting sharpness down to 1 (though you can't tell in web-sized pics) and setting white balance to 5100k (slightly warmed image), this 24mm shot is straight out of the camera. The Canon EOS-1D X settings were 1/2500 sec, f/2.8 and ISO 100. I added no additional contrast or saturation. 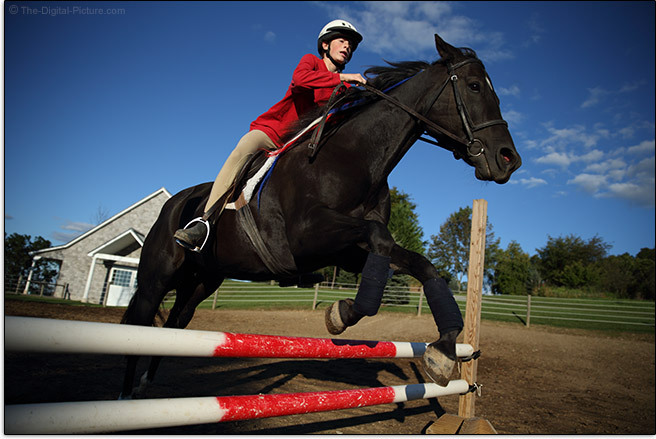 The vignetting framing the cantering/jumping horse and rider is natural for this lens at 24mm f/2.8. 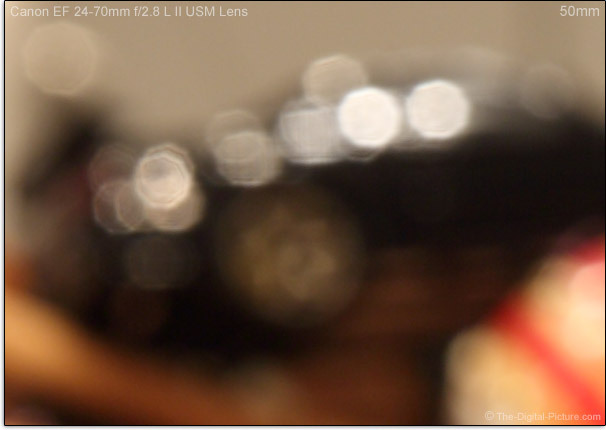 This is an internally focusing lens with FTM (Full Time Manual) focusing enabled. The front element does not rotate (important when using certain filters). The 24-70 L II is not parfocal. The 24mm focal length requires a slightly longer focus distance setting than 70mm, but this lens is relatively decent in this regard. Subjects change size modestly as they go into and out of focus, but remain solidly centered. The 24-70 L I does not change the size of subjects during focusing as much at 24mm as the II. As seen in the bokeh comparison above, the 24-70 L II acts as a slightly wider angle lens than the I at closer distances (these two lenses have similar angles of view at infinity). This difference is highlighted by the 24-70 L II's new MFD spec. 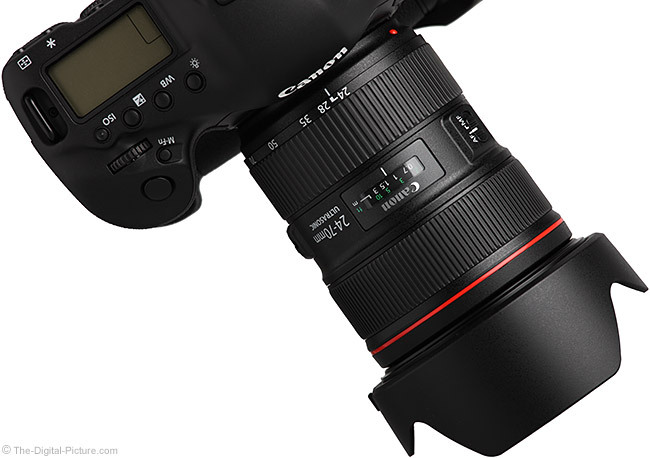 While the Canon EF 24-70mm f/2.8L II USM Lens retains the same MFD (Minimum Focus Distance) as the 24-70 L I, the "II" takes a solid step backward in its MM (Maximum Magnification). While the 0.21x is not an abnormal MM spec, the difference between it and the 24-70 L I's near-best-available-in-a-non-macro-lens 0.29x MM spec is quite noticeable. Those using the 24-70 L II will need to reach for extension tubes more frequently than those shooting with 24-70 L I. Here is a near-MFD sample picture. 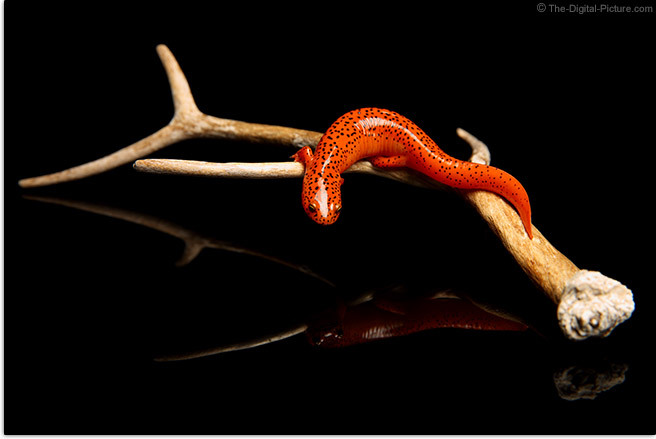 The swimming-pool-rescued Northern Red Salamander pictured here is just over 4" (100mm). I'll note that it was not a very cooperative subject. The 24-70 L II's MM specs with extension tubes are a healthy 0.63-0.18x with the Canon EF 12mm Extension Tube II mounted and 0.74-0.41x with the Canon EF 25mm Extension Tube II mounted. This lens is not compatible with Canon Extenders. As you would expect from a Canon L Series Lens, the 24-70 L II is very nicely built - and is expected to hold up to professional use - as the nearly identically-built 24-70 L I has. The 24-70 L II's focus and zoom rings are oriented as I prefer (zoom ring in rear), are very nicely-sized (now slightly larger) and operate very smoothly with no play (my 24-70 L I had a slight amount of play in the focus ring). The properly-damped rings have a just-right amount of rotation for their functions, though I would prefer a slightly less agressive focus adjustment at 70mm. The zoom ring grip now has narrower ribs that are spaced much closer together than on the 24-70 L I - similar to the focus ring. I find this design more comfortable to use. Engineering plastic construction continues to be used for the outer lens barrels. The single extending section of lens barrel has very little play. Extending the 24-70 L II in small increments causes minor slip-stick action to be exhibited by the otherwise smooth zoom ring. While not quite as smooth-zooming as the 24-70 L I, I expect the zoom ring to get smoother through use. In fact, so does Canon - they now include a zoom lock switch to prevent gravity zooming (gravity causing the lens to extend when carried downward). The much older 28-70 L I tested at the same time could have used this switch, but the 24-70 L II is not going to need the switch engaged for a while. And my 24-70 L I still does not need the switch. The 24-70 L II's front and rear lens elements are fluorine coated for easier cleaning. The Canon EF 24-70mm f/2.8L II USM Lens' finish is less reflective than the I's (notice the deeper, richer black color in the product images), some of the shiny parts of the I are gone and also gone is the white lettering around the end of the lens. This results in a slightly different, more clean appearance - a better one in my opinion. The 24-70 L II extends (1.23"/31.3mm) with focal length increase - a behavior shared by nearly every other zoom lens in this general focal length range. This is a major change from the 24-70 L I and its predecessor, the 28-70 L, that extend as the focal length is decreased. Here is a comparison between these three lenses. The 24-70 L II is nicer to use with the much smaller Canon EW-88C Lens Hood (included) in place and it stores more compactly. The lens is also much easier to grasp with the hood in reversed position. The downside is that the 24-70 L II's hood only properly shades the front element at 24mm. A much larger hood is needed to shade this lens at 70mm. The 24-70 L I and 28-70 L retract deep into their main-lens-barrel-mounted hoods as their focal length is increased, they have significantly better shading at the longer focal lengths. In other words, the 24-70 L I and 28-70 L are using an appropriate-for-the-selected-focal-length lens hood at all focal lengths while the 24-70 L II (and most other similar zoom lenses) are using a made-for-24mm hood at all focal lengths. The 24-70 L II's EW-88C hood, like many of Canon's other recent hood designs, has a release button on it. Like most petal'd lens hoods, this hood installs, both forward and reversed, in two positions. While both positions are fine to use, one reversed position places the release button against a table or other resting surface when camera mounted. Be sure the hood does not inadvertently unlock in this case. For many more comparisons, review the complete Canon EF 24-70mm f/2.8L II USM Lens Specifications using the site's Lens Spec tool. The weight-for-the-size of this lens combined with the quality build give it a solid feel - you know that there is something in your hand. The size and weight reduction this lens has over the I is welcome but I would not call the difference dramatic. Here is a look at the 24-70 L II beside four other lenses. The same lenses are shown rearranged by height below in their fully extended states with their lens hoods in place. As always, you can use the site's Lens Image Comparison tool to review many more comparisons. The Canon EF 24-70mm f/2.8L II USM Lens has a "Tight seal structure [that] ensures excellent dustproof and drip-proof performance" (owner's manual). You are going to want a protective filter on this lens to fully seal the area between the front elements and the lens barrel. Canon USA confirms that the filter is indeed needed for complete sealing, adding "The EF24-70mm f/2.8L II USM is similar to other black L-series lenses that accept front-mounted screw-in filters." I shot in the rain all day at Ricketts Glen State Park. While I kept the 5D III and 24-70 L II covered much of the time, they both got wet with no problems encountered. Canon 24-70 L I, 28-70 L and 24-105 L IS Lens owners looking to upgrade to the 24-70 L II need to factor in the change in what has been the standard L-zoom lens filter size - from 77mm to the growing-more-standard 82mm size. 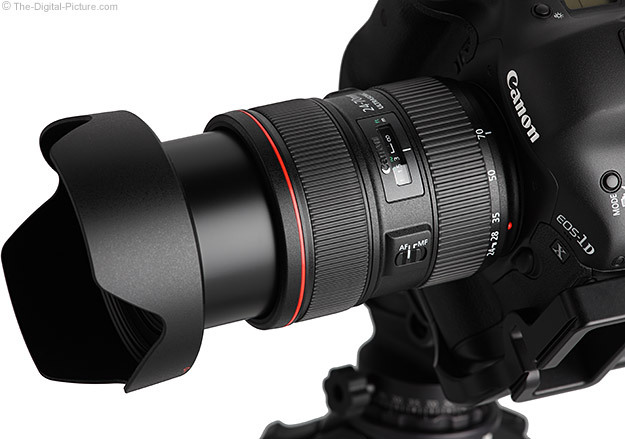 The 82mm size is no longer unusual for Canon lenses. 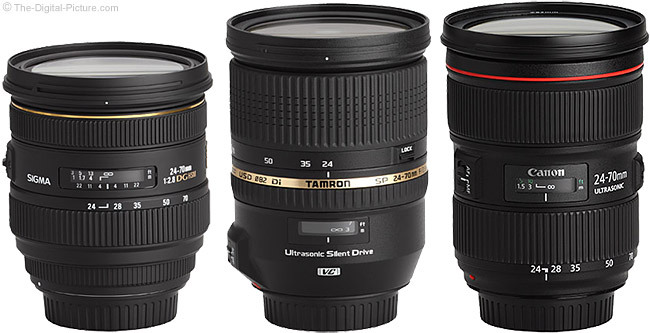 The 24-70 L II joins the ranks of the other L "II" lenses utilizing the 82mm size: the 16-35 L II and TS-E 24 L II. 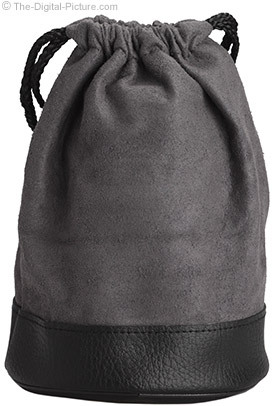 The included Canon LP1219 Lens Pouch is shown below. My Canon lens pouches stay in the original lens box - I want more protection than the dust and light impact protection these mostly unpadded pouches provide (the pouch bottoms are modestly padded). I've compared to the now-discontinued 24-70 L I throughout this review, and in most cases, the II will be the clear choice between these two lenses - and worth the upgrade for the sharpness/contrast improvements alone. An image with a motion-blurred subject is usually of no value (unless you are ging for that effect). Motion blur can be either subject motion or camera motion induced. For stopping action (subject motion) in low light, the 24-70 L II's f/2.8 aperture rules - allowing action photography in 1/2 as much light as the 24-105 L's f/4 aperture. For handholding in low light, in high wind, from an unstable shooting position or simply with shaky hands (all camera motion causes) with motionless subjects, the 24-105 L's 3-stop image stabilization rules - allowing handholding in as little as 1/4 as much light as the 24-70 L II (a 2 stop differential) even with the II's one stop faster f/2.8 aperture. If shooting from a tripod, the 24-105 L's advantage is eliminated. When image quality counts, the 24-70 L II is the clear winner. It is sharper/has better contrast at f/2.8 than the 24-105 has at f/4 and continues to win all like-aperture comparisons until DLA becomes apparent at f/11. The II has less distortion, significantly less CA and, until stopped down a couple of stops, less vignetting. The 24-105 L is significantly less expensive and has a longer focal length range. In general, the 24-105 L is better suited for travel and similar general purpose use when a tripod is not practical or desired, and the 24-70 L II is better for sports and indoor events including weddings and parties and for serious tripod-based photography (and for when the light is good enough for handholding without IS). 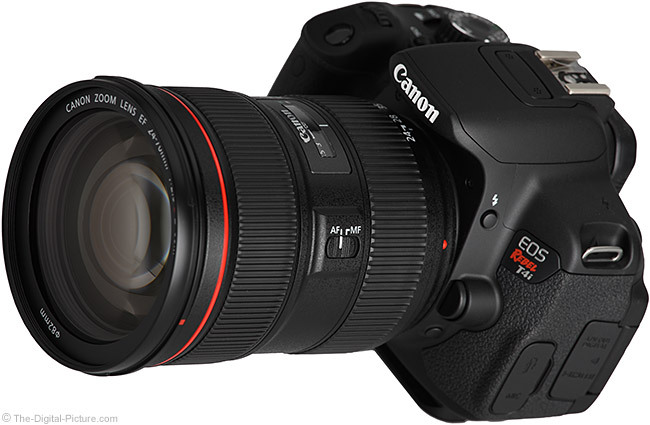 While APS-C owners will love the 24-70 L II, the focal length range (and image stabilization) found in the also-excellent Canon EF-S 17-55mm f/2.8 IS USM Lens may be a better fit for many. The Canon EF-S 15-85mm f/3.5-5.6 IS USM Lens offers image stabilization and nearly EF-S 17-55mm-equivalent image quality in an even wider range of focal lengths, but without the fixed f/2.8 max aperture. The 24-70 L II has better build quality than the EF-S lenses - and it has weather sealing. The 24-70mm focal length range is modestly better suited for APS-C portraiture than the 17-55mm range. Following is a visual comparison of the 24-70mm f/2.8L II and its at-review-time-primary third party 24-70mm lens competition. The same lenses are shown rearranged below (retaining height order) in their fully extended states with their lens hoods in place. The project of image quality-comparing the Canon EF 24-70mm f/2.8L II USM Lens to other lenses took on a life of its own for me. I'd be embarrassed to tell you how much time I spent doing this. Part of the problem is that there are a huge number of lenses that share at least one focal length with the 24-70 L II. Another issue is that zoom lens image quality can be quite complex. The comparisons presented below were shot on a perfectly clear day. Exposures in-camera were identical, but that does not mean that all images were the same brightness. For example, the 24-70 L II delivers images that are about 1/2 stop brighter than the 24-70 L I at 24mm. Therefore, all images within a focal length were brightness-matched at a central near-white point in the frame (using DPP) to make these comparisons easier to use. Differences in brightness in the comparisons are typically caused by vignetting at the wider apertures (these samples were taken from the outer portion of the image circle). Focus for these images was manually obtained from a point very low in the center of the frame (center-left for the 70mm samples). Note that field curvature (lacking a flat plane of sharp focus) can cause issues with image quality - and focusing on a peripheral subject can help or hurt image quality at other points in the frame for certain lenses. 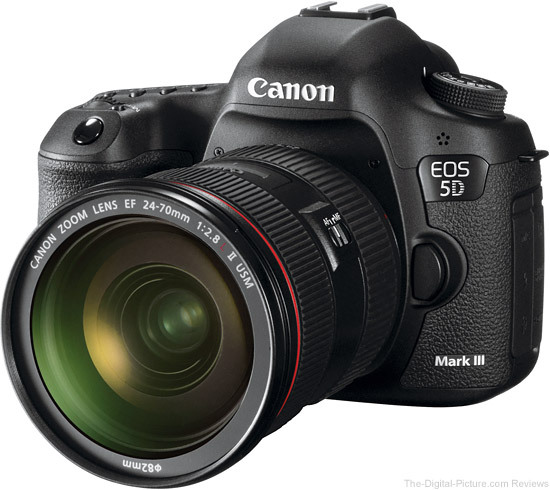 These Canon EOS 5D Mark III RAW images were processing in DPP with the Standard Picture Style and sharpness set down to "1" (very low). Crops from 121 images 16-bit TIFF images were stacked and aligned in Photoshop and saved at a 70% jpg quality. The 24mm samples are cropped from the far lower left corner of the frame. Note that, to reduce page load time (especially for mobile users), the following comparisons are being hosted on a separate page. Click on the image below to open this comparison in a new window/tab. Use Alt-Tab/Ctrl-Tab to toggle back and forth. Corner performance is a challenge for all lenses, especially at wide apertures and for zooms and especially for wider angle zooms. The 24-70 L II is really impressive in this regard. In this comparison, the Canon EF 24-70mm f/2.8L II USM Lens turns in image quality that is remarkably similar to the incredible Canon TS-E 24mm f/3.5L II Tilt-Shift Lens. This particular location in the frame compares especially unfavorably for the 24-70 L (and the 24 L II). And especially favorably for the Tamron 24-70 VC that is softer on the right side. The 35mm crop compared below is taken from near the lower right corner of the frame. The 35mm mark on the lens barrel was used for all zoom lenses tested. Once again, the 24-70mm f/2.8L II compares especially well against the matching-focal-length Canon L prime lens. The Sigma image quality performance deteriorates in the outer portion of the image circle as the focal length is increased. The Tamron is not as well represented by the right side of the frame. Update: After multiple lens purchases and two trips to Tamron service, I have a Tamron 24-70 VC with right-side image quality that matches the left. The 70mm crop is taken from the extreme bottom center of the frame. Again, click on the image to load the comparison. Click on the image to load the comparison. Since we moved left in the frame, the Tamron is once again turning in impressive image quality. And I once again am showing a portion of the frame unfavorable to the 24-70 L I at f/2.8. To be honest, I considered long and hard about removing the 24-70 L I f/2.8 image as I don't feel like this image well-represents this lens. I decided to leave it with the disclaimer. The Canon EF 70-200mm f/2.8L II IS USM Lens frames this scene modestly tighter than the other lenses at 70mm. The image quality coming from this lens is not so complex - it is simply phenominal. This is the best zoom lens I've ever used - and is the best Canon DSLR zoom lens made. And the 24-70mm f/2.8L II is an outstanding complement to a kit with this lens in it. The 24-70mm f/2.8L II is a very clear upgrade from the 24-70 L I. My experience with the Sigma 24-70mm f/2.8 EX DG HSM Lens is lab/studio only at this time. From a build quality perspective, the Sigma is very nice with smoothly functioning focus and zoom rings. There is little or no play in any parts. Notable is the Sigma's low price. It is also modestly shorter. The Canon is considerably sharper/has better contrast at f/2.8 (you are probably buying an f/2.8 lens to use it at f/2.8) and continues to be the better lens optically even when stopped down. But, the Sigma is much closer in image quality by f/4 (by f/5.6 at 70mm). The Sigma has more CA at the focal length extremities and less flare at 70mm. While the Sigma is not slow-focusing, the Canon definitely focuses faster. The Tamron 24-70mm f/2.8 Di VC USD Lens shipped before the 24-70 II - with the highly-desired image stabilization feature - termed VC (Vibration Control) by Tamron. 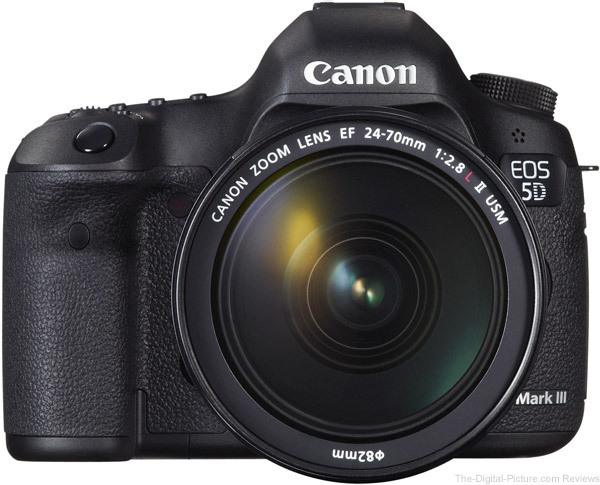 And it carries a substantially lower price tag than the Canon (but more than the Sigma). Like many others, I was very anxious to see how the new Tamron performed and, though I have not completed a full review of that lens, I will share some comparative information. The first is that the Canon has considerably better image quality than my second Tamron 24-70 VC - even at f/8 on the right side of the image (Tamron contacted me to replace the first copy of this lens as it had big image quality issues). The Tamron compares much more favorably in the mid and left side areas of the frame. As discussed before, the Tamron has poor bokeh but does have a bit less flare at the long end of the focal length range. The Tamron has more CA at 24mm, but less at 70mm. The Tamron autofocuses more slowly than the Sigma and much more slowly than the Canon. While it performs reasonably well in One Shot AF mode (used on the 5D Mark III), the Tamron's AI Servo performance is very poor with a high percentage of OOF (Out of Focus) shots. I highly recommend avoiding this lens for capturing action. The Tamron's rear-positioned focus ring is not my favorite - and the vibration/hummmm focusing sound it makes when adjusted while held at a very specific angle is disconcerting. Otherwise, and like the Sigma, the Tamron seems nicely built with smoothly functioning focus and zoom rings with little or no play in any parts. 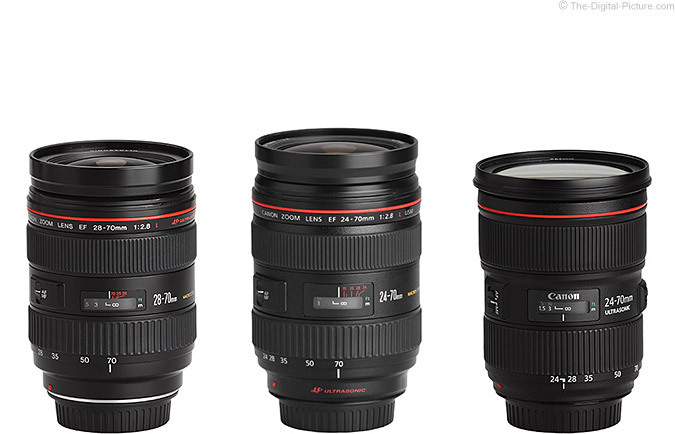 There are numerous Canon prime lenses that fall within the 24-70mm focal length range. These lenses typically (but not always) have a lower per-lens cost, a smaller physical size, reduced distortion, reduced vignetting at comparable apertures and wider apertures. Again, those are the typical advantages - but not all hold true in all comparisons. Sharpness and contrast used to be an advantage held by most primes, but ... the sharpness and contrast difference between the 24-70 L II and the primes falling into this range is much harder to discern. The differences are probably not significant for most. The versatility of having the range of focal lengths in the mounted lens is often preferred. Primes falling into the upper and lower focal lengths of the 24-70 L II will continue to hold a lower-distortion advantage. While I often use 24mm primes (mostly the TS-E 24 L II Lens and 24mm f/1.4L II Lens) for landscape and low light photography, I seldom use any longer-than-24mm but below-85mm prime lenses. With its impressive image quality, Canon EF 24-70mm f/2.8L II USM Lens will be my go-to lens in this range unless I need a wider aperture or less distortion. Or IS. As were its predecessors, I fully expect the Canon EF 24-70mm f/2.8L II USM Lens to become one of Canon's most popular and best-selling lenses - until it is replaced. It's that good - and it's that useful.